Day 2 turned out to be a great day at the GPS 2016 show in Calgary. 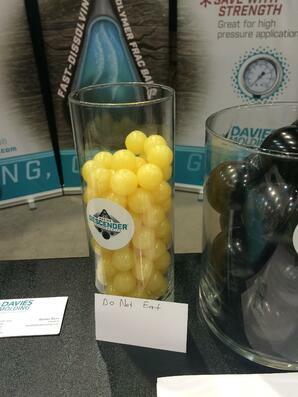 We had many visitors come by the booth to learn more about Davies and our Descender line of dissolvable frac balls. We had one person think our frac balls were candy! We added a disclaimer, to make sure nobody would eat them. They are dissolvable, but not for human consumption. This certainly became a topic of conversation. Yesterday, we had an opportunity to visit with one of our Heico sister companies, ARDCO. 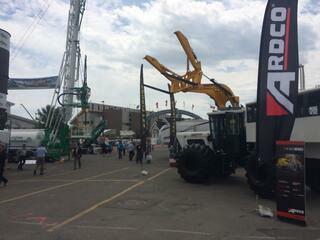 They were displaying their impressive off-road equipment in the outdoor area at the show. Today, is day 3 of the show. It's the final day. We'll give you a recap on the last day and closing of the show tomorrow. Stay tuned!